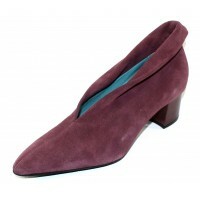 This bootie can also be worn with a fold-down cuff. Leather linings and leather insole. 2 inch self covered block heel. Rubber sole. Made in Italy. This bootie can also be worn with a fold-down cuff. Leather linings and leather insole. 2 inch se..